â&#x20AC;&#x153;All of the faculty and staff at Gillette College are really helpful and always available to answer questions. Living on campus is a great way to get to know other students and find ways to get involved.â&#x20AC;? * NOTE: For more information about our graduation rates, the median debt of students who have completed the program, and other important information, please visit our website at http://www.sheridan.edu/gainful-employment. Gillette’s garden shops are budding with knowledgeable experts to solve any problem. We’ve handpicked our favorites. This kit will save you money. Meet 4-H chicken champion Chaylin Stephens as she preps to compete again at this year’s Campbell County Fair. Master Gardener Sandra Aberle gets us gardenready with expert advice on everything from lighting to potting. Get into the fold with the ranching and gardening family, and local YouTube sensations, Our Wyoming Life. Moorcroft’s Garden Gnomes volunteer group rally together to cultivate and grow a kickass community garden. Inquiries & Customer Service Outliers Creative, LLC P.O. Box 3825 • Gillette, WY 307.686.5121 • 82717@mcllc.net 82717 is a publication of Outliers Creative, LLC © 2019, all rights reserved. Reproduction in any form, in whole or part, without written permission is prohibited. This magazine accepts freelance contributions. 82717 is not responsible for loss, damage, or any other injury to unsolicited manuscript, unsolicited artwork (including but not limited to drawings, photographs, or transparencies) or any other unsolicited materials. 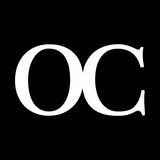 Outliers Creative, LLC is a wholly-owned subsidiary of The MC Family of Companies, LLC. irds are chirping, days are warmer and longer. Life is good. It’s time for new love, renewed possibilities and reconnecting with good ol’ Mother Nature. The editorial team here at 82717 couldn’t be happier. Why? We’re itching to get outdoors, have some fun in the sun and spruce things up a bit. 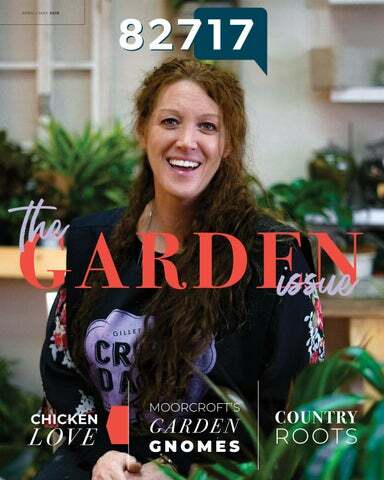 This month, we share our refreshed enthusiasm with you, our friends and neighbors, via the first annual Garden Issue of 82717 Life Magazine. Welcome! It comes budding with Master Gardener insights, our thoughts on the top shops of the season, heaps of gardening greatness and more. Beginning with local YouTubers Mike and Erin Galloway of “Our Wyoming Life” family ranch and garden (who make money letting people watch their cows), we take you through their production first-hand and ask the tough questions like what it means to become an internet sensation overnight. Dive into our interview with local gardening rebels, the Moorcroft Garden Gnomes, who speak gregariously about going against the grain and sticking it to the man to cultivate a community garden with their bare hands, seeds and soil. Clover Kids In this issue, we introduce our new “Clover Kids” series, where we invite you to follow along with local 4-H’ers of all ages and competitive classes as they train their livestock and prepare their projects in anticipation for the upcoming Campbell County Fair, beginning July 26 through August 4. Let’s get social Look for CCF Clover Kid updates across our socials @82717Life. Find and share your progress — from beef to cake decorating — by scrolling through our #ccfcloverkids hashtag on Instagram. It’s serious fun! More online at 82717Life.com There are more great things happening online! From local events to added features from award-winning contributors and community mavens, along with exclusive video discussions about the stories you see here in print, we’ve got it going on all month long at 82717Life.com. he ground may have only just started to thaw, but that doesn’t mean you can’t start a garden, according to Master Gardener Sandra Aberle. But, as evidenced by the recent winter storms during the past few weeks, the outdoors may still prove to be hazardous to young vegetables, which makes an outdoor garden not practical, at least for now. Sandra advised that while it is too early to plant in your backyard and greenhouses, it’s definitely not too early to start growing indoors. LIGHT Growing indoors, however, can be tricky. Essentially, it’s like having a garden in the living room devoid of natural sunlight. This means that when starting a garden inside, artificial light is a necessity. be set on a timer, or the gardener needs to keep an eye on the clock, to turn off after around 16 hours. This is to mimic the natural day/night patterns that will give the plants some rest. “Plants need rest too,” Sandra said. sidewalls, which they are apt to do if properly cared for. Sandra’s method provides a simple alternative: layer on more newspaper. It also means the plants won’t have to force their way through the plastic later when transplanted into an outdoor garden, seeing as newspaper will generally decompose in the ground. too, though they are not quite as sturdy as members of the cabbage family and may benefit from planting later in the season. of a base, such as peat moss or pasteurized soil, mixed with sand, vermiculite, or perlite, according to oregonlive.com. When the seeds sprout, itâ&#x20AC;&#x2122;s time to move them into potting soil. In some ways, it resembles seed starting soil with one important difference â&#x20AC;&#x201C; potting soil usually contains some sort of fertilizer and organic material to provide growing seedlings with ample nutrition. ilbert Oedekoven smiles down from the seat of a John Deere tractor in the faded, sepia photo hanging on the barn wall. Even in death, he watches over his ranch property 10 miles south of Gillette on Highway 50, which he left to his wife Rita Whalen. His step-daughter Erin Galloway and husband Mike have since taken over the dayto-day operations, and she wonders what Gilbert would think to know his ranch has gone viral. urban life in Cheyenne and Boston. A call from Gilbert changed all of that. His health was getting worse, and would they mind coming home to help feed the cows that winter? Though Erin was technically from Gillette, sheâ&#x20AC;&#x2122;d been in college when her mother married Gilbert, and other than brief stints home during the summer, sheâ&#x20AC;&#x2122;d only tagged along on ranch chores and never participated. Nonetheless, they quit their jobs and made the move to northeastern Wyoming. hard days as well as the good, and keep track of a running chore list, which they slowly tick off items as months go by. Last year, Mike attended a YouTube seminar in Cincinnati to learn more about marketing and making their videos and channel stronger. Things like taking off their sunglasses, for starters, while Mike was told leave on his Stetson, because without it, nobody could recognize him. Many channels decide to monetize their videos, which entails allowing YouTube to put ads in the videos. In order to do so, a channel needs to have at least 1,000 subscribers and 4,000 watch hours in the previous year. For every 1,000 views, you earn a dollar. “It’s a full-time job on a part-time salary,” Erin said. In recent months, however, they have figured out how to market their brand, selling merchandise on their webpage and signing up affiliates on Amazon, which is more or less a product recommendation. Small add-ons seem to be paying off, like the window cam that looks out onto the pasture, where for a $1 a month, people can watch cows all day long. In a million years, Mike never conceived anyone would be interested in that and has been pretty blown away by the positive reception. Some people comment on the wide, blue sky and vastness of the flat, treeless prairie, and sometimes on the clouds. “One guy asked me what those white streaks in the sky were,” Mike said. “He had never seen a contrail from a jet because he’d always lived in the city.” The weird thing about having your life broadcast into strangers’ homes all over the country and world is both flattering and daunting. As a former radio DJ Mike is a natural, but it took Erin a while to feel comfortable seeing herself on video and she still struggles. The live chats are a little strange, too, as people write in with questions. Some of those can be pretty comical, like when viewers ask why they don’t milk their cows or why there are no trees in their yard. Every day, their email in-box is flooded with correspondence from viewers, and they frequently get packages and letters in the mail. That day, Erin returned home from the post office with a padded envelope from a female viewer in Texas. Inside were three Easter baggies for the kids full of pastel jelly beans and chocolate eggs along with a handmade ornament, ornately decked out with sequins and fancy lace edges. She just loves their show, the woman wrote, and appreciates their lifestyle and the oldfashioned values they’re raising their kids with centered around family, faith and hard work. The ornaments aren’t much, the woman continued, but they’re made for your children with love. “It’s so touching that people watch our shows and see us like family,” Erin said. Most of their subscribers aren’t from the area, and off screen in Gillette they are rarely recognized, though once in a while someone makes the connection. Last week, Mike knew his wife had been to Albertson’s when a viewer posted a photo of her – “Mrs. Our Wyoming Life” – out shopping with the kids. When Mike told her that, Erin was horrified because the kids had been particularly bad that day and she wasn’t sure what part of that “horror show” the viewer saw and if the woman had seen her yelling. Those are the somewhat unnerving moments, Erin laughed. Sometimes people even stop by, like the Italian couple, who on a visit to Yellowstone and Mt. Rushmore, decided to take a trek out to Campbell County to track them down. They stopped by on their way to Mt. Rushmore then returned afterwards to give Mike $100 to take his wife out. They had found their show on YouTube and were big fans. Another time, while they were livestreaming a branding, a couple strangers turned up and asked how they could help. They’d been watching the show unfold on YouTube and figured they’d come over and lend a hand. That’s the bizarre part of doing their channel, the sharing of their lives with strangers, who often turn up in real life. They’re flattered that their lives appeal to so many people, and that they are able to put Wyoming and its rich ranching heritage on the map. For many, it’s a foreign and widely misunderstood world that some – like PETA activists – take umbrage to with their negative comments on their site about mistreatment of animals and carnivores in general. ayhem and Mischief are trouble makers, Chaylin Stephens explained, as she bent down to pick up one of the black and white speckled roosters pecking at her shoe. The aptly-named Mayhem squawked and flapped his wings as she grabbed him and deftly flipped him on his back on the trampoline in her backyard, at which point he promptly mellowed. “You’re not going to like this much,” she explained to the rooster as she prodded his belly and straightened a wing, ticking off a laundry list of things that the 4-H judges will be looking for when she competes this summer at the Campbell County Fair. chickens to see which one will be her showmanship bird. She'll show 25 birds at fair in total. The showmanship chicken has to be easy-going with a trainable disposition, which pretty much rules out the roosters. Her ringer, a black and white Mille Fleur Belgian Bearded d’Uccle hen named Missy, is currently out of commission due to an injury. She doesn’t know what happened, but one day she came into the coop to find Missy and another rooster limping. She thinks there was probably a skirmish, but you never know when it comes to chickens. For now, Missy is in the basement recuperating with the newborns, and has left Chaylin in need of a backup. Feathers flap in a cloud of dust as the birds make a beeline to dodge Chaylin’s quick-draw hands as she ducked down. She cornered one trying to escape through the bird-size door into the hen house. As far as chicken coops go, Chaylin’s borders on fancy. Her stepdad, Tron, refurbished it out of an abandoned storage trailer on the family’s 14-acre spread south of Gillette off Highway 50.
breed them and sell their eggs. Money that will go to fund gymnastics, which along with the chickens, consumes most of her time. She tries to give all of her chickens names – Pecky, Humdrum, Sparrow – but as she points out, with close to 80 birds, you kinda start to run out of ideas. For now, she’s content helping her younger sister, 8-year-old Chyla, get ready for her first chicken competition at fair. riving by Goven/Thar’s Farm & Ranch Supply storefront off Burma Road, you’re more likely to notice the brightly colored metal yard décor than the new name on the signage. After managing Thar’s for 14 years, Jessica Goven purchased the business in October 2017 when Gary Thar retired. “We kept the name, but changed it a little, because a business that’s been here for 40 plus years, you don’t change,” Jessica explained. This time of year, she’s staying busy. Grass seed is just one of the hot commodities. As always, they stock reclamation and garden seed, fencing supplies, and a wide variety of tack, livestock feeds, supplements and supplies. Basically, Goven Thar’s is a locally owned and operated one-stop shop for anything Ag related. It can be hard to keep things green year-round in Wyoming, but Gillette’s nursery scene is actually budding with experts who can help solve any planting problem. Problem: You have limited space for foliage in your tiny apartment or dimly lit office. Jordan Tucker. This guy knows succulents, and air and house plants. Talk with Jordan for one minute, and you’ll see what we mean. We know, because his expert recommendations helped our sprightful content specialist bring her perfect home office to life. plant where and when in short-seasoned Wyoming. Experts in native species, the seasoned pros at Landscapes by Holcomb, including owners Mike and Devie Holcomb, regularly make seasonal planting recommendations and have been in the business locally for over 15 years. (They know their stuff.) In addition to commercial and residential landscaping installations, they also have a large retail area where do-it-yourselfers can purchase trees, shrubs, rocks and mulch—making Landscapes by Holcomb your one-stop shop for all things gardening. You’re tired of paying top dollar for grocery store herbs and want to try growing your own—but don’t know where to start. your garden to the next level, but it’s missing that something extra special. Draw out a layout of your outdoor living space on grid paper and experiment with styles and placements so you can get the best combination to serve your needs. atio furniture lets you turn your outdoor space into an extension of your living room. With a wide variety of colors and styles to choose from, the right patio furniture will provide long-lasting enjoyment and a place to entertain comfortably when great weather beckons. The easiest way to purchase patio furniture is to buy in sets. A patio set will come in all kinds of styles and sizes from a simple bistro set with two chairs and a coordinating table, all the way up to a dining set with seating for six or eight. The advantage of buying in sets is that you can easily outfit an entire patio for one price and all the furniture will be perfectly matched. However, you are limited to a single style; if you tend toward a more eclectic style, purchasing a set as your sole outdoor decor may be less satisfying. Size Do you have a smaller balcony that can only hold a chat set? Or does your backyard have space for entertaining? Are you planning to host a lot of outdoor parties on the patio? Do you need versatile patio furniture like stackable chairs and tables for extra guests or are you looking for a larger comfortable set for relaxing? With so many choices, it can be difficult to find the patio furniture that matches your home style and your lifestyle. Home Depotâ&#x20AC;&#x2122;s Choose Your Own Color program lets you customize a look of your very own by choosing the patio collection, color and fabric. generations, and increasingly, they’re losing touch with where their food comes from. The Garden Gnomes took the idea to the Moorcroft City Council, asking permission to co-opt the now-defunct playground behind the old elementary school, which has since been converted into the community center. The playground equipment had been torn down, with the exception of a spider-shaped jungle gym that, after a brainstorming session, the group decided would make a great gazebo. “The land was just sitting there growing weeds,” Elaine said. he plastic owl drooped from its perch on top of the chain-link fence surrounding the Moorcroft community garden. He’s fallen asleep on the job, Elaine Buckmiller noted, but in a few months, he’ll be back to his post when his shift begins for the summer. His job is to guard the grapevines from the birds, which last year, proved to be an effective deterrent. Right now, the garden doesn’t look like much buried under thick shrouds of snow, but Elaine and friend Marge Reed already have big plans for the summer. Powder River Shrine Circus The Annual Shrine Circus is the biggest source of funding for the local fraternity, and your participation makes it possible for them to maintain our local lifeline in the community. CamPlex Heritage Center Theater Wed., May 1. First performance at 4 p.m., second performance at 7:30 p.m. Tickets available at White’s Frontier Motors, K2 Technologies and Teacher’s Corner/Kid’s Mart. Springfest Family Night for John Paul II School Dinner, silent and dessert auction, and kids' games with all proceeds to benefit John Paul II School. Cam-Plex Wyoming Center Equality Hall Sat. May 4 from 5:30 to 7:30 p.m. Contact Melanie, Kandis, or Marla at (307) 686-4114 for details. Wyoming Energy Summit Hear from experts regarding the most pressing issues facing Wyoming's energy landscape. Conference only (May 8), includes continental breakfast and lunch: $99. ITC Tour (May 7): $20. Tour of local coal mines (May 7): $20, Preconference reception and dinner at The Prime Rib Restaurant and Wine Cellar (May 7): $40. Combo purchase (May 7-8)., includes conference, preconference reception and dinner, and your choice of tours: $139.